I did a little bit of digging into this, and found some more interesting things related to this. Now, first understand that I am not a Hebrew scholar; I’m not even an amateur. I have just barely begun learning some basic Hebrew. So if I am way off, I’m sure there are those who will correct me. It takes a few stumbles to learn how to walk. Ex. 28:41 – And thou shalt put them upon Aaron thy brother, and his sons with him; and shalt anoint them, and consecrate them, and sanctify them, that they may minister unto me in the priest’s office. Ex. 29:9 – And thou shalt gird them with girdles, Aaron and his sons, and put the bonnets on them: and the priest’s office shall be theirs for a perpetual statute: and thou shalt consecrate Aaron and his sons. Ex. 29:29 – And the holy garments of Aaron shall be his sons’ after him, to be anointed therein, and to be consecrated in them. Ex. 29:33 – And they shall eat those things wherewith the atonement was made, to consecrate [and] to sanctify them: but a stranger shall not eat [thereof], because they [are] holy. Ex. 29:35 – And thus shalt thou do unto Aaron, and to his sons, according to all [things] which I have commanded thee: seven days shalt thou consecrate them. Ex. 32:29 – For Moses had said, Consecrate yourselves to day to the LORD, even every man upon his son, and upon his brother; that he may bestow upon you a blessing this day. Lev. 8:33 – And ye shall not go out of the door of the tabernacle of the congregation [in] seven days, until the days of your consecration be at an end: for seven days shall he consecrate you. Num. 3:3 – These [are] the names of the sons of Aaron, the priests which were anointed, whom he consecrated to minister in the priest’s office. Judg. 17:5 – And the man Micah had an house of gods, and made an ephod, and teraphim, and consecrated one of his sons, who became his priest. Judg. 17:12 – And Micah consecrated the Levite; and the young man became his priest, and was in the house of Micah. 1 Kgs. 13:33 – After this thing Jeroboam returned not from his evil way, but made again of the lowest of the people priests of the high places: whosoever would, he consecrated him, and he became [one] of the priests of the high places. 1 Chr. 29:5 – The gold for [things] of gold, and the silver for [things] of silver, and for all manner of work [to be made] by the hands of artificers. And who [then] is willing to consecrate his service this day unto the LORD? 2 Chr. 13:9 – Have ye not cast out the priests of the LORD, the sons of Aaron, and the Levites, and have made you priests after the manner of the nations of [other] lands? so that whosoever cometh to consecrate himself with a young bullock and seven rams, [the same] may be a priest of [them that are] no gods. 2 Chr. 29:31 – Then Hezekiah answered and said, Now ye have consecrated yourselves unto the LORD, come near and bring sacrifices and thank offerings into the house of the LORD. And the congregation brought in sacrifices and thank offerings; and as many as were of a free heart burnt offerings. Ezek. 43:26 – Seven days shall they purge the altar and purify it; and they shall consecrate themselves. There are other instances in which the word “consecrate(d)” was translated from a different Hebrew word, but the male’ yad combination is the most common. This hieroglyphic could have been a representation of a common Egyptian censer, or incense vessel, that was used. The unique thing about this instrument is the sculpted cupped hand at the end of the tool. A drawing of it can be seen here. 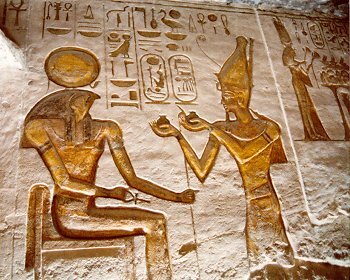 This tool being used by an Egyptian can be seen here, or offering incense straight from the hand here. A modern studio recreation of this instrument can be seen here, which they call “An Heru.” Notice that sometimes it appears that the incense was offered directly from the hand, whereas in other instances it was in a bowl held in a cupped hand. Other Egyptian examples can be seen here, or here, or here, or here, and here. The literal meaning of Kaf is “palm” which is considered the location where potential of the Yod (hand) is actualized (interestingly, the gematria for the word Yod is the same for the letter Kaf). For this reason we bless children with palms facing them and we envision God as having His palms over us, for this image suggests the calling forth of the latent power of the spirit within for manifestation in the physical world. . . . 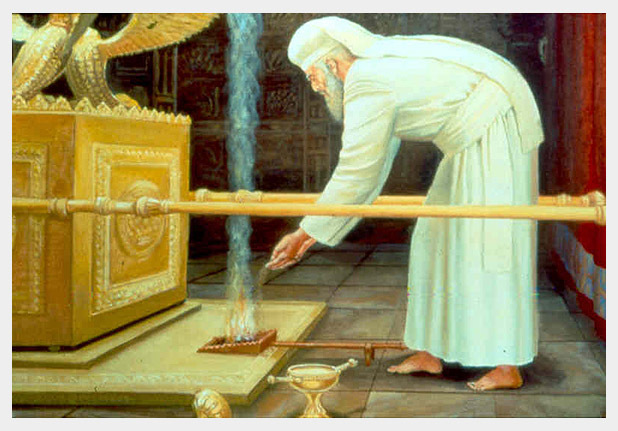 So bringing all of this together, when we read of God commanding Moses and Aaron to be “consecrated,” or to “consecrate,” the Hebrew words behind this term connote filling a cupped hand with incense in order to make sacrificial offerings to God in His holy place of the temple. A paper by Lynn and Hope Hilton on this subject has been around for awhile. I’m glad I wasn’t way off! I had heard of some of this before. Pretty insightful, isn’t it? As shown by a scripture you mentioned in a previous post, this is in imitation of the priestly activities of the angels in Heaven. “And the smoke of the incense, which came with the prayers of the saints, ascended up before God out of the angel’s hand” (Rev. 8:3–4). The angels hold the incense in cupped hands in the presence of God. And the posts of the door moved at the voice of him that cried, and the house was filled with smoke. . . . The “smoke” in the temple and the “coal” that it taken with tongs off the altar is almost certainly incense and the burning of it, which in this case is used as a symbol of atonement, redemption, cleansing, and of the divine presence. It would seem to me that the hand as a cup and the hand with palm down are a pair. Your post and the article by the Hiltons address the one, but not the other. Are insights available? The two seem to me to represent receiving and giving. Or receiving and then placing on an altar. In fact, there seems to be a logical progression of such symbols. Good point Rick. I, personally, have not seen any insights on a hand with palm down in any literature, but I will keep my eyes open. There is, of course, the laying on of hands, which is palm down. In response to Rick, don’t quote me on this, but I thought I read somewhere that there is a similar Egyptian symbol that signifies mercy and justice. Hand up is asking for mercy, hand down signifies refusal/justice. I could totally be making that up, but I thought I read it somewhere. interesting history lesson. I like the scholarly work. Bryce, I recommend that you check out Stan Tenen and the Meru Foundation’s work concerning the Hebrew letters, if you haven’t already done so. The palm is symbolic of the feminine/receiving (womb etc) and the yod is the seed being sent. Thus also the protective hamsa/hand of Fatima. Bagging the seed so to speak (the dot within the circle). Being consecrated means being impregnated by the sacred. There is a great description of the filled hand and how it relates to the sacrificial offerings in Bible Dictionary – “Priests”. After the initiate priests were washed, clothed, and anointed, they (the inititiates) then made three offerings: a sin offering (with the meat going to the officiating priests), a burnt offering (with anything not burnt going to the officiating priests), and a peace offering (with the meat this time being returned to the initiate – his hand is filled with the fat and meat. It seems to me that the sin and burnt offerings are “sacrifice” offerings (that is, nothing is returned to him), and the peace offering is the “consecration” offering. Compare this to the modern-day law of consecration. As it was practiced in Joseph Smith’s day, a person entering into the law of consecration would transfer all of his property to the Church by legal deed, after which the Church would return (usually all of) the property to the person, again by legal deed. The person’s hand is filled, but now his property is consecrated – dedicated to God in Holiness to the Lord. In the Strenghtening Marriages and Families book, I forget the page number, the Author cites an interesting insight into the palm up/palm down depictions of Buddha and Bodhisattva statues, stating the palm up is the grateful reception of all divine gifts, while the palm down is the governing use of such gifts. David: Hands up could signify the asking for mercy; hands down could signify receiving/acceptance or the granting of mercy.